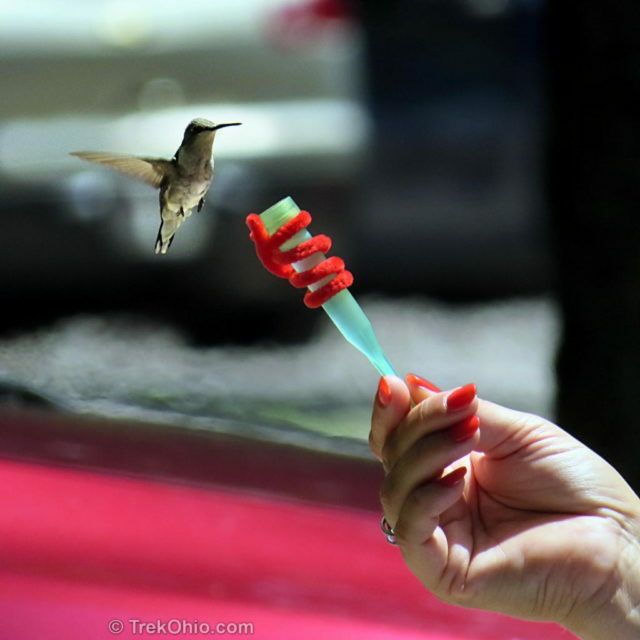 The Nature Center at Lake Hope State Park is well-known as the place to go if you want to try hand-feeding hummingbirds. This seasonal activity typically begins in July. This year park officials will continue to host the hand-feeding sessions on Thursday through Sunday from 1 to 3 PM until Labor Day. 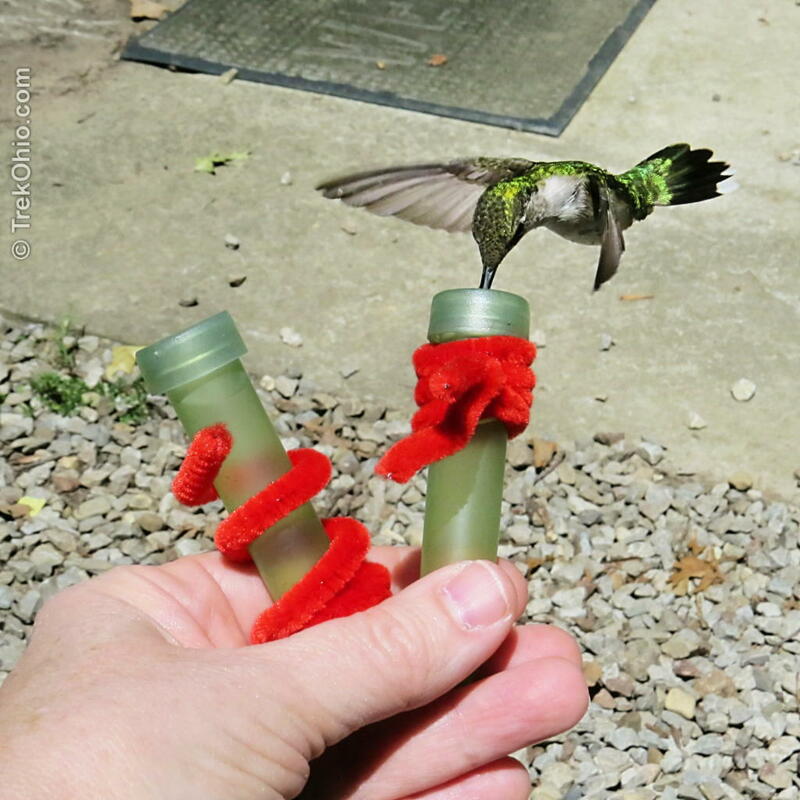 This was the first time Bob and I had tried hand-feeding hummingbirds, and we both loved it. 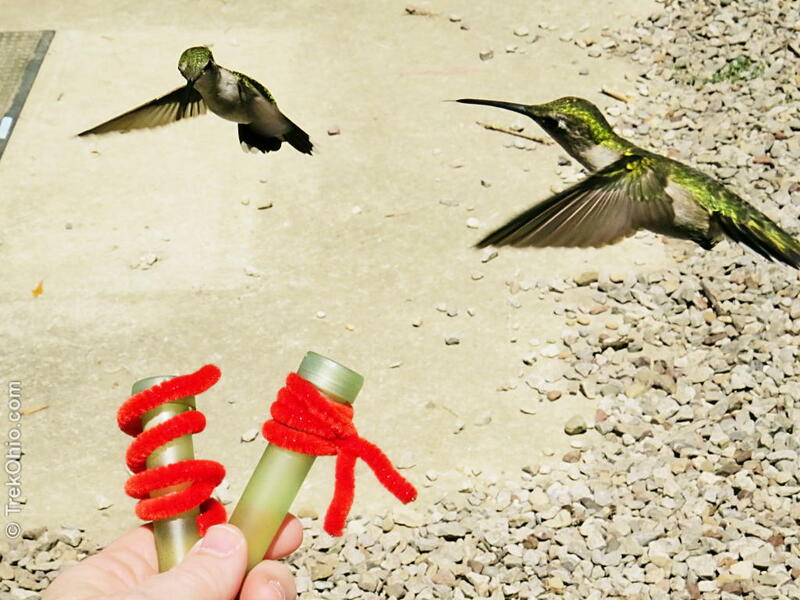 It is fascinating to watch hummingbirds perform their aerial acrobatics, but it was even more amazing to have these wild, little creatures come right up to us to accept our offerings of nectar. We could feel the wind from their rapid wing beats on our hands. There was some competition for nectar. 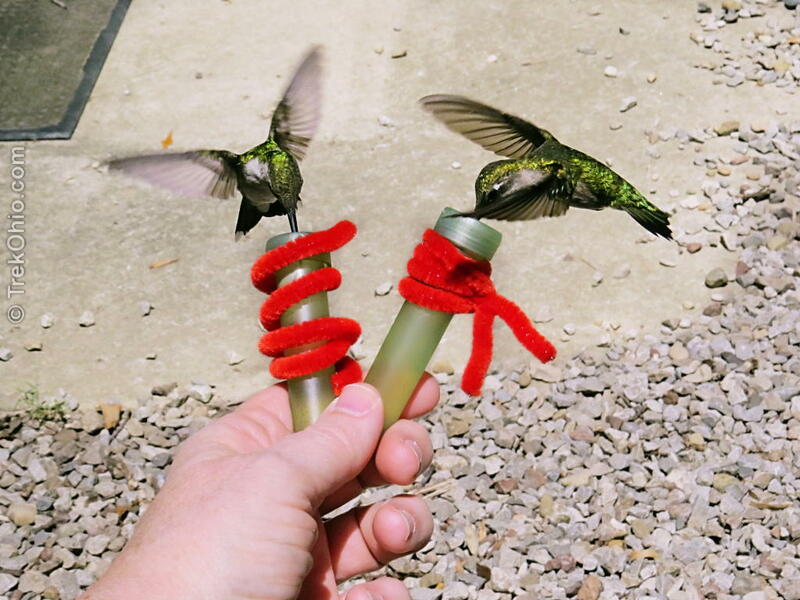 Bob and I each got a feeding tube for the hummingbirds, but we ended up taking turns so that one of us held the feeding tubes while the other took photographs. This woman did her nails in the hummingbird’s beloved color, red. The ruby-throated hummingbird is the only hummingbird that nests in our state. Surprisingly every single hummingbird that we photographed was a female. 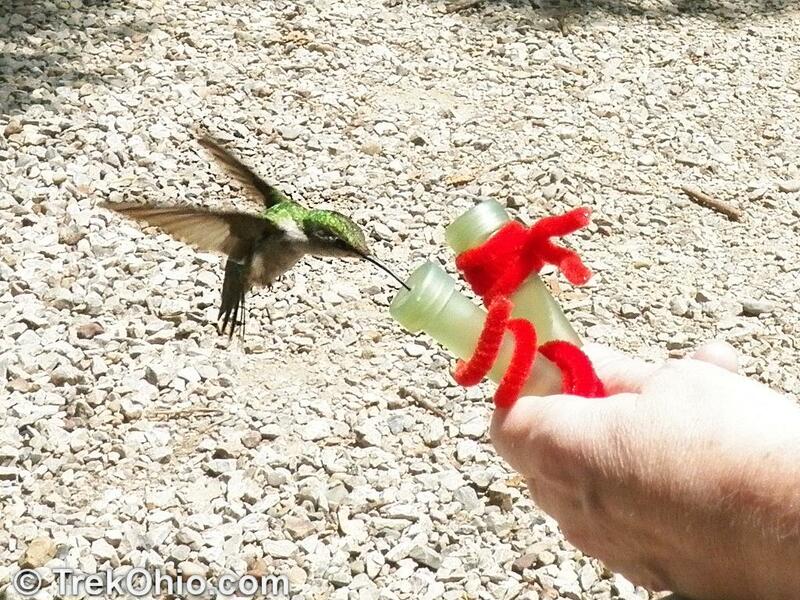 In addition to photographing the hummingbirds, we also took a video of them as they fed from my hands. Since two females are jostling for position, you can watch as they attempt to chase each other away. You can also hear the hummingbirds vocalizing. The environment around the Nature Center has been made as enticing to hummingbirds as possible. There are both flowers and hummingbird feeders all over the place. Then during the prescribed time the center’s naturalist takes down all the hummingbird feeders and hands out nectar-filled tubes to park visitors. 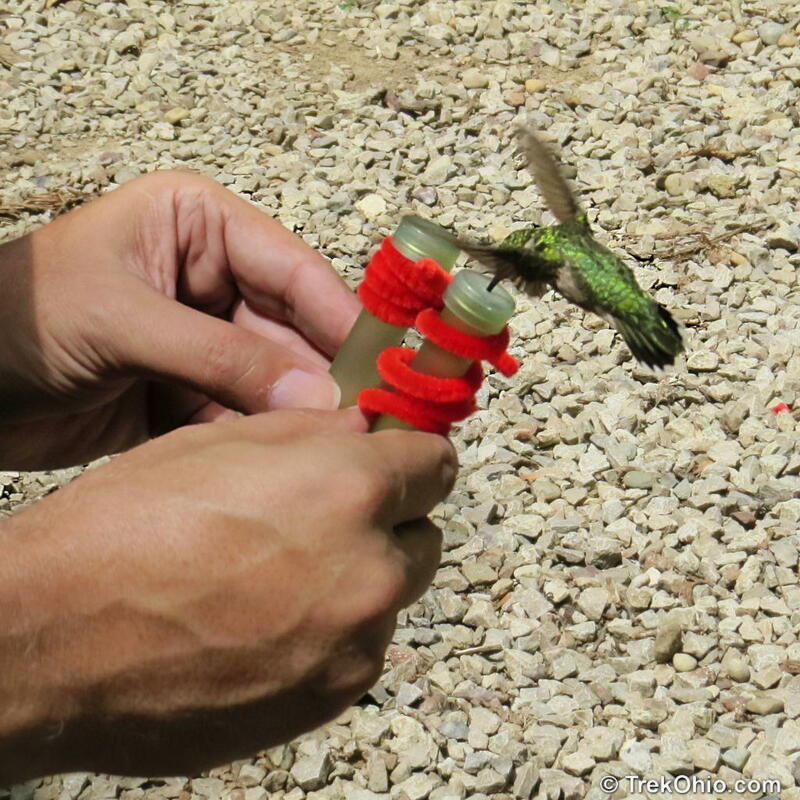 The naturalist said that visitors had the better success in feeding the hummingbirds when they sat near the building. In addition she recommended that we hold the feeding tubes in the sunlight rather than in the shade because the bright light accentuated the red color of the pipe cleaners that are wrapped around the tubes. We arranged our chairs so that we were sitting in the shade of the building while our hands were in the sun. Some people hold their feeding tubes up toward the sky in an attempt to entice the birds. The problem in doing this is that your arm soon becomes tired. Because these are wild creatures it is important to not fidget a lot, or you will scare them away. We had a lot of success in just resting our arms against our legs, so we could stay still for a longish time. We did sit there for what seemed like a long time before hummingbirds started coming over to us, but it was well worth the wait. There were a number of children participating in the hand-feeding, and I think this could be a lot of fun for a child. The only catch is that your child has to stay still and be patient until a hummingbird decides to come over, and this may be hard for some kids to do. It might help if you let your child know what to expect before hand. We held our feeding tubes with the ends tilted away from us. This may have made approaching the feeding tubes less intimidating, but it also brought the liquid inside closer to the opening, making it easier for the bird to reach the nectar. Visitors have the option of making a small donation to support the Nature Center inside the building. 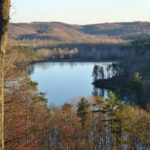 TrekOhio: Vinton County Parks & Nature Preserves; Lake Hope is located in this county. 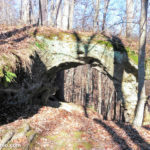 Check out this page for links to the park’s official website and to learn about nearby parks. PBS.org: Infographic: All About Hummingbirds; includes all sorts of interesting information about hummingbirds, such as the fact that they have the largest brain relative to their body weight of all birds. TrekOhio: Lake Hope State Park: this is a more general description of Lake Hope; after feeding the hummingbirds, there are lots of things to do there, including having a delicious meal at the Lake Hope Dining Lodge. The Nature Center is located at the arrow in the map below. 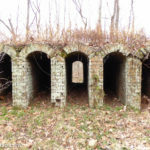 Take 278 and turn on to Furnace Ridge Road. Before you come to the Nature Center, there is a gravel parking lot on the right-hand side of the road. The Nature Center is a short walk north from here on the left-hand side of the road. Share the post "Hand-feeding Hummingbirds at Lake Hope"
I am so interest in coming to Lake Hope. Is there any way to get info from you? Holly, I might be able to help. What were you interested in learning? Wow. Must have been great experience. I have never seen hummingbirds live. 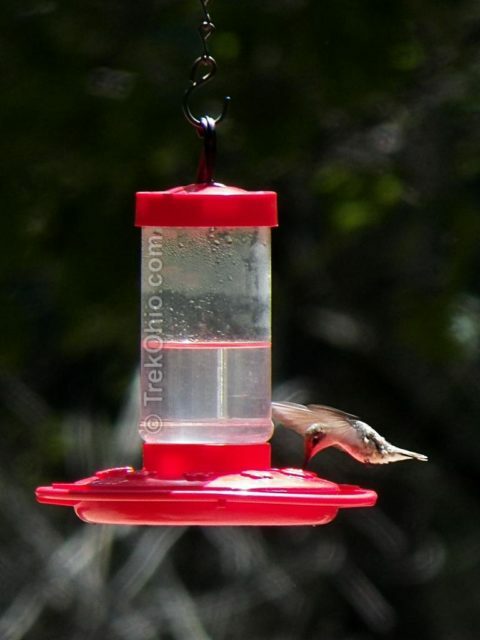 Hummingbirds are amazing, they can hover and even fly backwards. There are no hummingbirds in Europe today, but there WERE hummingbirds in Europe 30 million years ago. I’ve read all about this place before. 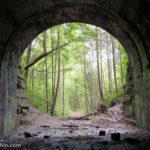 So glad to see it here on your blog. There is nothing like having these little creatures feed from your hand and light on your finger. Thanks for this lovely post. We live about 3 miles “the way the crow flies” from Lake Hope. Regularly we have about 30 or so hummers who come daily to our three feeders. We refill the feeders daily and sometimes even more often. Mom said when she was alive that whenever the hummers emptied a feeder they would peck on the windows to let her know the feeders were empty. While not having that experience, I do get close “flyby’s” regularly when the feeders are empty or nearly so. They are a daily highlight. They also predict rain as they fill every hole in the feeders and several more hover around waiting an open spot. That’s incredible! Do you also garden in a way that attracts hummingbirds, or is it just the feeders that’s bringing them in? Deb: We do have a large garden but just the normal stuff, no real attractors planted. However, I do hang several baskets near the feeders. They like petunias, moss rose, calibrocha, begonia, and just about anything that might have a showy bloom. They are even attracted to white blossoms. I have seen them feeding on the hosta and visiting the daylilies. Mom had them well trained. It was just amazing. If you ever get a chance to do this, I whole-heartedly recommend it. Wow, that would be an amazing experience! Thanks for sharing.